Yesterday, I participated in a Center for American Progress forum where a new study on unions and social mobility was released. The study, by my Harvard colleague Richard Freeman and collaborators, showed a significant correlation across American metropolitan areas between the extent of union membership and social mobility. Freeman, who based his research on data in the famous studies of Raj Chetty and his collaborators, also showed that the children of union members earn higher wages and are healthier than other children. This is important work. From Ted Cruz to Bernie Sanders, there is agreement across the political spectrum that equality of opportunity is an American ideal — that Thomas Jefferson was right in saying that America should be an aristocracy of talent. Yet equality of opportunity in the U.S., no matter how measured, lags behind other countries and certainly has not progressed over the last several decades. Chetty’s celebrated “equal opportunity map,” reproduced below, shows that there are no grounds for fatalism. Different parts of the U.S. deliver very different levels of social mobility, while all in the same global economy, with the same technology, and the same increasing proclivity of able men and women to marry each other. There is nothing immutable about the existing inadequate level of equal opportunity. 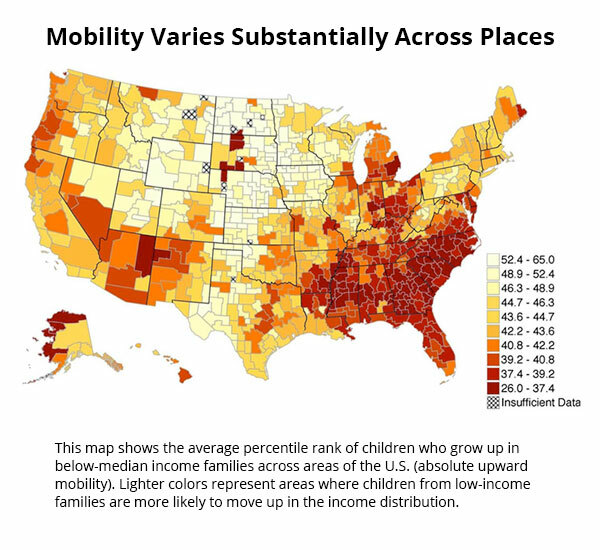 The map demonstrates that equality of opportunity is particularly bad in the old confederacy and particularly good in some of the old bastions of abolitionism. It is not therefore surprising that unions, which were concentrated in the North, turn out to be correlated with equal opportunity. More impressive is the research result that looking across families, fathers who are union members have children who earn at least 15 percent more than those who are not in union families, and that this stands up even with various control variables added. The implication is that supporting unions not only helps workers who are members themselves but also helps their children and communities as well. Few people believe that private unions in the United States had excessive power in the 1970s. Yet the share of private sector workers in unions has fallen from over 24 percent in 1973 to under 7 percent today. Unions are surely too weak today. Their weakness most clearly shows up in workers who have difficulty maintaining a middle class lifestyle. In a more profound way, the weakness of unions leaves a broad swath of the middle class largely unrepresented in the political process, paving the way for the kind of disillusionment that has driven the Trump candidacy. After all, no society is going to remain stable and confident in its central institutions if parents do not believe their kids can lead better lives than they did. Broadly shared prosperity is even more elusive today, so what is needed going forward? I would suggest three important steps. Second, the union movement needs to expand on its efforts to build models of collective action that are not rooted in traditional command and control corporation. This may include increased emphasis on profit sharing, on labor management dialogue, on industry wide bargaining, and many other ideas as well. Organized Labor needs to adapt to the pervasiveness of white collar, pink collar, and no collar work in addition to traditional blue collar work. Third, there is a compelling case even if it does not appear politically realistic right now for labor law reform to give more scope to those seeking to organize workers. There are detailed agendas of possible reform. What is important now is that a consensus form around the idea of reducing burdens on union organizers. Thanks to the work of Freeman and his collaborators, we now know that stronger unions are not just good for their members, they are good for our country and our descendants. Strengthening collective worker voice has to be an important component of any realistic American inclusive growth agenda. Perhaps if we had a Public Labor Advocate that any employee could register with and request job negotiation assistance. The PLA could be an agency like the Consumer Financial Protection Bureau. The agency would be authorized to investigate discrimination in the hiring of its members. It would not take long for the number of members to overwhelm employer sizes, creating true countervailing power, as JKG so advocated as necessary. And thanks much for that distressing chart. Agreed. In addition there are also benefits to employers who have a unionized workforce including: fewer employment practice claims, lower employee turnover, and workforce training. A strong and responsible modern labor movement could play a constructive role in rebuilding the American middle class, and solving some of the great structural challenges of today’s economy.